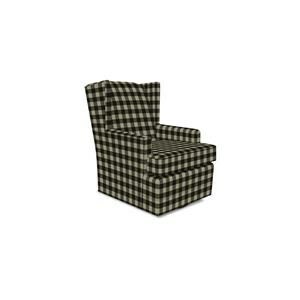 Traditional never goes out of style and neither will your home decor when complemented by this upholstered chair. Classic stylings are exhibited by the antique brass nailhead trim, rolled arms, slight curves, and slightly tapered wood legs. Style aside, this chair is also ideal to come to after a long day with its perky seat cushioning and semi-attached plush back cushion. 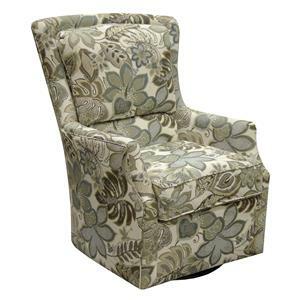 The Neil Traditional Upholstered Chair with Rolled Arms and Nailhead Trim by England at Virginia Furniture Market in the Rocky Mount, Roanoke, Lynchburg, Christiansburg, Blacksburg, Virginia area. Product availability may vary. Contact us for the most current availability on this product. Treat yourself to some much needed relaxation and add some elegant style to your home with this traditional collection. The rolled arms, slight curves, and optional nailhead trim all demonstrate a time-honored style that works on its own and complements other surrounding fixtures. Additionally, the semi-attached backs and perky cushioning provide all the comfort and support you will need. The Neil collection is a great option if you are looking for Casual furniture in the Rocky Mount, Roanoke, Lynchburg, Christiansburg, Blacksburg, Virginia area. Browse other items in the Neil collection from Virginia Furniture Market in the Rocky Mount, Roanoke, Lynchburg, Christiansburg, Blacksburg, Virginia area.